We are counted among the ecstatic Micro Ohms Meter Manufacturers and suppliers, based in India. 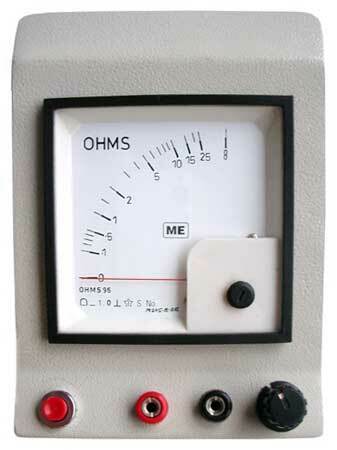 ME Ohms Meter is a sensitive, portable, self-contained, battery operated, moving coil type of ohms meter. The anti parallax mirror scale and knife-edge pointer in the Volt Ohms Meter provide accurate readings. PRESS TO READ switch avoids Battery drain. An infinity adjustment potentiometer helps to provide accurate readings without effect of variations in battery voltage. Mechanical zero adjuster is provided to adjust zero. Choice of 25, 50, 100, 300, 500, 1000, 2000 and 5000 ohms. Â± 5% of the indicated value at center scale. 100mm X 100 mm X 60 mm. 1 number of pen cells of 1.5 volts, Eveready type 1035 or equivalent. Test Leads and rexine carrying cover.